With kind support from around the world, the infrastructure for daily life is gradually being restored. Nevertheless, continued support will be required for true recovery to take place. 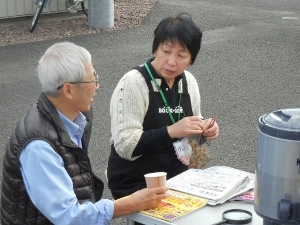 After the disaster, the BOOKOFF Group donated ¥10 million to the Japanese Red Cross Society, and also launched the Sell to Support and Support for Mobile Libraries in Tohoku (operated by the Shanti Volunteer Association) activities to provide support through books, CDs, DVDs, and game software. With this thought in mind, the BOOKOFF Group has been providing continuous support with “what BOOKOFF can do” together with our customers, with a sense of closeness to the disaster victims and the people involved in the recovery effort. The purchase amount normally received by sellers for books, CDs, DVDs, and game software sold via BOOKOFF Online using the Takuhonbin (home pickup delivery service), can be donated. Under Sell to Support, the BOOKOFF Group adds 10% to the purchase amount and donates the total amount to the Central Community Chest of Japan, also known as the Red Feather, to be used for support in damaged areas. Reservations are made simultaneously for the number of packages and pickup date. Please package the items you wish to sell. Note: Books, CDs, DVDs, and game software are eligible. A parcel delivery service will pick up the items at no charge. Note: The driver will bring a printed delivery receipt. The BOOKOFF Group will retain the purchase amount, add 10%, and donate the total amount to the Central Community Chest of Japan. 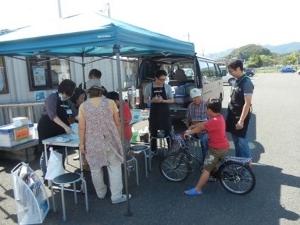 The public interest incorporated association, Shanti Volunteer Association (“Shanti”) operated mobile libraries in areas where public libraries and bookstores suffered major damage from tsunami triggered by the Great East Japan Earthquake. When a customer sold books, CDs, DVDs, or game software via BOOKOFF Online using the Takuhonbin (home pickup delivery service), the BOOKOFF Group added 10% to the purchase amount and donated the total amount to Shanti to fund its activities and for purchases of new books. In addition, books purchased for use by mobile libraries were purchased as new books from bookstores in the affected areas. 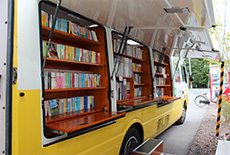 A mobile library service was initiated in July 2011 by the Shanti Volunteer Association in response to the fact that people in areas that suffered damage were not able to enjoy reading. 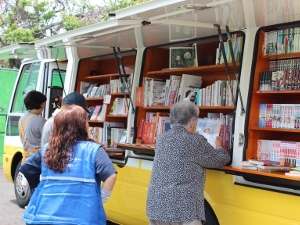 Picture books, comic books, novels, practical guides, and other books are loaded onto a vehicle that visits temporary housing, and people can borrow the books they want and return them the next time the mobile library visits. 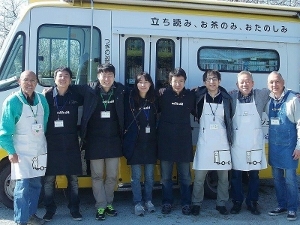 BOOKOFF chain employees went to the affected areas and assisted with the operation of mobile libraries. Directing people inside the mobile libraries, helping people find the books they were looking for and lending the books, serving tea, and other activities, gave these employees an opportunity to communicate with the mobile library users in the affected areas.